Hellblade: Senua’s Sacrifice, is what I’m inclined to call a ‘narrative’ hack and slash’ game developed and published by independent games studio, Ninja Theory. Ninja Theory are also responsible for games such as Heavenly Sword, and the re-boot of DmC: Devil May Cry. They have garnered a reputation for developing high-quality games. Something which Hellblade most certainly is. In fact, simply ‘high-quality’ is doing it an injustice. It’s a masterpiece. A term I don’t swing around too often. 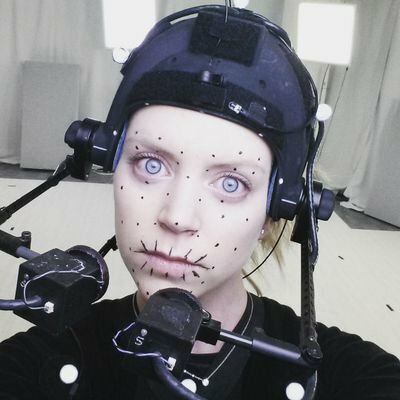 Melina Juergens, wearing the motion capture gear used for Senua’s facial animations. We join Senua’s story as she reaches the North, land of Vikings and Norse Mythology. She embarks upon this quest after being forced to witness her lover Dillion’s killing by way of Blood Eagle. Senua is then driven towards the Norse gods, in the hope of bringing Dillion back; bringing him back to her side as the only one she is able to trust and to love. One single item carried on her person throughout shows us Senua’s resolve in this quest – Dillion’s head. Beside the voices, it is also one of the first hints towards the illness Senua’ is plagued by, letting us glimpse at the stark world she is a member of. Hellblade is a very personal experience… to a terrifying degree. Hellblade is filled to the brim with nuance and fantastic detail. And, of course, it would be irresponsible of me to say I understand all of this, alongside its heavy meaning. After all, I have never suffered with psychosis – part of a set of mental health issues Senua deals with. Though, It’s understandable to say mental illnesses share certain loose similarities. Of course, this is not to say they are all to be tied together, only that one can see and partially empathise with something that comes close to what has already been experienced first-hand. However, empathy in this case is a frightful thing. For Senua’s world is an unimaginable one. I’m assaulted by Social Anxiety and Depression everyday, it’s something I’ve been dealing with for much of my life. In some ways, it enables me to – for better or worse – step into Senua’s frantic shoes. To see the world through her eyes. It’s easy to form a connection with her, to notice the similarities between the two of us. To also understand the differences. It would be silly, and careless of me to say I’m disinterested in mental illness and the mind. With it being so intertwined within my life, it’s surely an obligation to understand it to the best of my ability. In this sense, Hellblade is bittersweet in the things it inflects. It’s art. It’s literature. It’s education. And, it’s utterly beautiful. Yet, it reminds me of my own mind’s actions. Putting me at the mercy of certain thoughts. Leaving me in hesitation of which way those thoughts might swing, and what they might mean. For is this not the purpose of Hellblade? To give us insight, to educate us on things that are – in most cases – impossible to personally experience? To nurture compassion for? I wonder, what would it be like to hear voices that are not there? What would it be like to see things that do not exist? Sometimes, I even contemplate the reality of the things I live. After all, how can any of us be certain what ‘reality’ is? How do we know our eyes tell the truth? Hellblade is a lesson in this. On not being certain. On the journey to be certain. On realising it is impossible to be certain of anything, ever. Senua learns this in the final moments of her journey, just before it is too late. Before acceptance becomes an impossibility. Senua comes to understand, that it is not ridding herself of the demons she is persecuted by that’s imperative, but accepting they are a part of her. And, that they may well be for the rest of her life. Psychosis, can be hereditary. (genetically passed down by blood relatives – parents, grandparents, etc…) In Senua’s case, this is certainly true. Her mother, Galena, suffered from the very same illness. The one that ultimately led to being burned at the stake, at the hand of Zynbel, her husband (Senua’s father). Naturally, Senua does not desire to meet the same fate – being helpless to her father’s complete misjudgment of what ails her, and his hostility that follows. This, in part, motivates her on the long journey North, in search of Hel. Hel is the underworld, realm of the dishonorable dead in Norse mythology. Comparable to Hell in Christian belief. Hel, (the goddess. Hela in Hellblade) presides over the realm of Hel, which is often refered to as Helheim. One of the nine ‘realms/worlds’ that exist in Norse Mythology. Below for reference on the Nine Worlds, pictured on the World Tree (Yggdrasil). Mental illness simply wasn’t a concept in the time of Hellblade (around 9th century CE). Many of those who suffered with mental health issues in such times were hated, ostracised, exiled, and even killed. All because of something that wasn’t understood, something that they had so little power over. Senua knows this all too well. Her lover Dillion realises that she is not ‘possessed,’ nor broken, only she harbours ‘demons’ that must be overcome with all the might she has, and the emotional support he is able to offer that other cannot even come close to. It seems like he is alone in this compassionate judgement. Therefore, after his death, what does Senua have left but her memories, and the delusional hope of bringing him back…? Throughout her journey, Senua faces many challenges. The warriors Senua fights are a visual representation of the daily battle with the relentless, and insidious ‘demons’ that reside within her. I believe, they have ‘real’ physical form in the shape of Viking warriors, but not the exaggerated, demonic figures that Senua perceives. They are , in part, a creation of her mind. A brutally violent aspect of her psychosis in action. It’s a haunting depiction of how the illness skews the actual world, overlaying it with nightmares that feel far more real than what would otherwise occupy the space. Senua is without a doubt intelligent. She knows the hallucinations and voices are unreasonable. And, in some part, she realises they are a creation of her own troubled mind. Though, it is one to tell yourself such things, and another to believe it. Dillion acted for her in this role: A barrier between Senua, and the hideously dark depths of her mind. Ultimately, after his death, she descends into those very depths. As her quest draws to a close, she fights the Beast there – the monstrous demon hiding in the shadows, attempting with all its strength to endanger her with its ruminations. Somehow, mental illness is still stigmatised on a far wider scale than we might like to believe. We do not understand much of the mind, nor the things we actively think, and how those thoughts manifest themselves – what they have the potential to develop into. Each person’s mind is a truly unique thing. There’s no such notion as universal experience. We all live our own reality. A reality that is forged exclusively by our own psyche. This makes it inherently difficult to have any inclination in the mind of anyone but ourselves. Enter Hellblade, and Senua. Hellblade is supported by Wellcome Trust. A worldwide charitable foundation that pursues vital research into important areas of health, and related sciences. Ninja Theory also consulted with Paul Fletcher from Cambridge University. A professor of Health Neuroscience, and a psychiatrist with special interest in psychosis. You can watch a Development Diary including Prof. Fletcher and members of Ninja Theory exploring Senua’s mind. Media in general hasn’t always portrayed mental health in a fashion that is compassionate, nor helpful; in fact, often quite the opposite. Hellblade spears this idea head-on, conveying a too-little known issue that is more or less invisible to the majority of society. Not to mention, video games have had little connection to mental health in general, often shying away from the subject in whole. On the other hand, Hellblade represents the subject with respect, and in a way that is both sensitive, real, and mature. Ninja theory should be commended for this. For their dedication to understanding psychosis in its entirety; giving us an accurate depiction of the things Senua suffers from. And, in turn giving us valuable insight into the illness more widely. Letting us, in a direct perspective, experience the hell that many people suffer through. Some, rather sadly, alone and silently like Senua. We know what cancer is. We know what heart disease is. We know what liver cirrhosis is. We know what septicemia is. Yet… what percentage of society has accurate knowledge of psychosis, of schizophrenia, of depression, and anxiety. We think we know so much. In truth, we know so little. Hellblade, and Ninja theory have tackled this. Giving us a game that is solid in both mechanics and story, but also one that has real moral value, depth, and more than anything, a visceral experience from which we can take many lessons. It is not necessarily a game you ‘enjoy’ in the true sense of the word, but one that rips open your perspective, one that manages to deliver a true emotional response. Something the world of gaming needs a whole lot more of. The Tree from which the roots spread. Hellblade: Senua’s Sacrifice, is available on PS4 and PC. For those of you who enjoy games, and also the subject matter, I implore you to give it a shot. For it is truly wonderful. Scary, but wonderful. And, all this coming from a person who is dead to the world… Seriously, check it out. Support the developers and all the people who were involved. What did you think of Hellblade, and what it represents?